Grill gloves are a necessity for those who grill with charcoal. 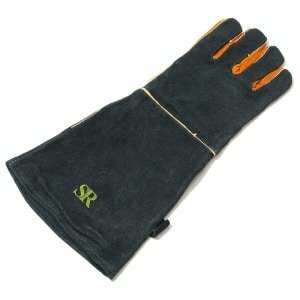 These long leather gloves will protect you from the heat while moving your coals and allow you to pick up hot items for a short period of time. Grill gloves are made of leather and are typically longer then a oven mitt. Some have additional padding in the palm and finger areas for extra protection from the heat. Most are made with a black leather to hide the grease and grime. The longer length allows you to stay above the heat without burning your arm hair and will even allow you to occasionally bump the hot metal of your grill without injury. This type of glove is a lot more flexible then a welders glove, allowing you freely move around your fingers. 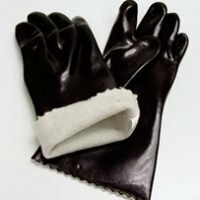 A good leather glove is also great for use with a rotisserie. Allowing you to grab the hot bare metal of the spit rod close to the load when removing it from your grill. As long as you are careful not to handle very hot things for more then a few seconds at a time they will protect your hands. As soon as you begin to feel the heat penetrating the leather glove you need to put it down. Also a wet glove will transfer the heat inside a lot faster so do not rinse them off if your planning on continuing to use them that day. 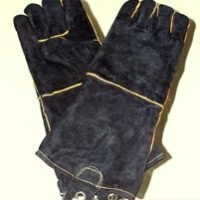 If you hold onto something to hot for to long, it will result in a hard spot on the leather, but the gloves will still work. I would think under very extreme conditions it could even burn through the leather creating a hole. 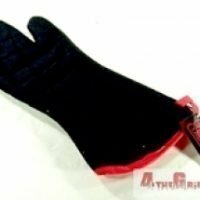 There is also a supposed grilling glove on the market that looks like an “Ove Glove”. We are not fans of this type of glove because it will not properly protect your forearm, its just to short.